Suppleness means your pony bends through his whole body in both directions. In other words, when you’re riding a bend, turn or circle, he should be bending around your inside leg in the direction you’re asking. As well as boosting your score in dressage tests, correct bend will really help your jumping, too. You’ll be able to stay balanced through a course and have a big advantage when it comes to tight jump-off turns! TOP TIP – Look around the corner to let your pony know where you’re asking him to go. Remember to sit up tall and keep your shoulders back to stay balanced and square in the saddle. If your pony’s overbending, it’s normally because his neck is bent too much while his body is straight. You can test this by checking your view while riding on a circle. If you can see the whole side of his face, his neck and head are bent too much. If you can just see his eyelashes and the corner of his inside eye, you’ve got just the right amount of bend! TOP TIP – Your legs, not your hands, produce a good bend. If you just use your reins to bend, your pony won’t be supple through his body. Keep your leg on for a good bend every time! If your pony doesn’t bend in the direction you’re asking him, first make sure he’s had enough of a warm-up to loosen up. Then think about your aids – you’re likely to be stiff through your body and not using enough leg. Bring your shoulders down and back to relax, then focus on using your legs, rather than your hands, to make the bend. The good news is, whether your pony has too much or not enough bend, there are loads of exercises you can do to encourage him to be more supple. This is a fun way to improve your pony’s suppleness and should help if he falls in when he turns, too. Challenge yourself by bringing the poles close together or riding a 10m circle around each one. TOP TIP – Jump wings work well as bending poles, or you can use buckets instead. These are a great place to start to encourage your pony to bend on a smaller circle. TOP TIP – Ride the exercises on both reins to make sure your pony doesn’t favour one direction over the other. A serpentine is made up of half-circles joined up by straight lines across the arena. In a 20x40m arena, three-loop serpentines are the most common. Once you’ve got the hang of serpentines, take it up a level by riding a circle in each of the loops – take it slowly and don’t rush, as your pony will need to stay balanced to keep a steady bend on the circle. Spiral circles are a useful tool to encourage your pony to bend through his whole body. 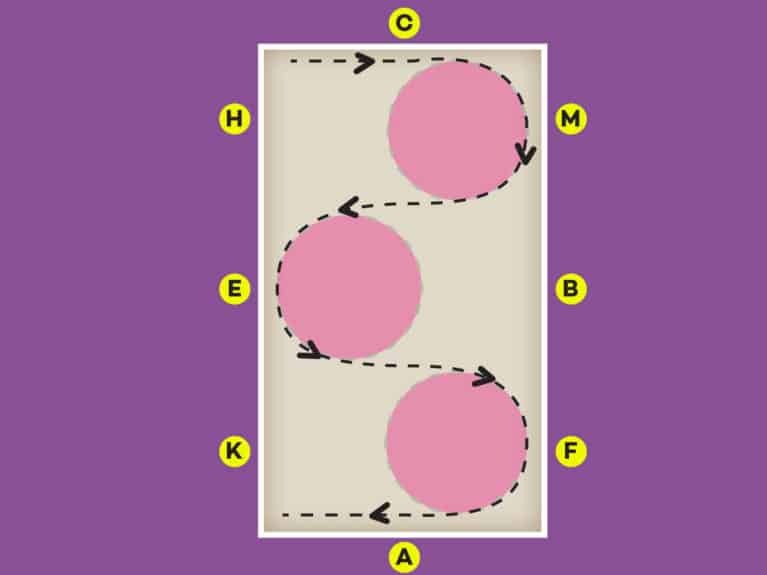 TOP TIP – Once your pony becomes more supple, you can make your spiral circles smaller and bring the inner circle down to 10m.